We a happy to present a new yarn, and hope you will give "Tilia" a warm reception. Tilia is a gorgeous mix of glossy mulberry silk surrounded by a cloud of the lightest kid mohair. 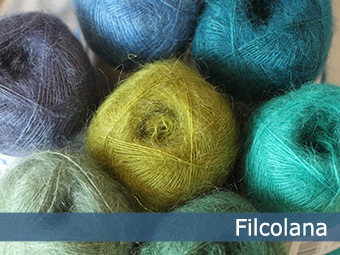 On the technical side Tilia is a fine, worsted spun and brushed yarn. You can of course knit Tilia on its own, but we recommend knitting it held together with one of our other yarns. New Zealand lammeuld and Indiecita are wonderful held together with Tilia.